Birth*: Jane Cattanach Stirling was born in 1891. 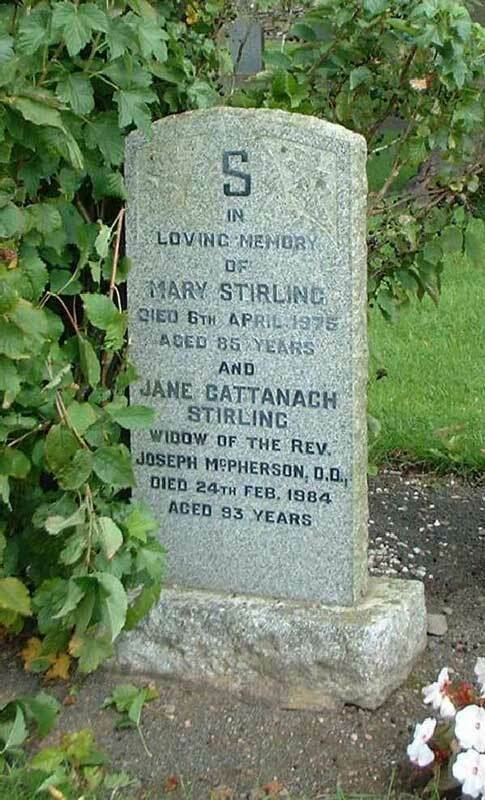 She was the daughter of James Beattie Stirling and Jane Stirling Cattanach. (Bride) Marriage*: Jane Cattanach Stirling married Rev J M McPherson DD on 4 November 1930 at St Oran's Church, Edinburgh, Scotland; image held GROS 685/02 0440; 1930 marriages in the district of St Andrew in the cirt of Edinburgh; 440; 1960 on the fourth day of November at St Oran's Church Edinburgh after banns accrding to the forms of the Church of Scotland; Joseph Mckenzie McPherson DD minister parish of Dunnichen widower, 55 Manse Dunnichen Angus, Neil McPherson farmer (dec) Jessie McPherson ms McKenzie (dec); Jane Cattanach Stirling school teacher spinster, 39 James Beattie Stirling tailor (dec) Jane sStirling Stirling ms Cattanach, signed James D Macdonald minister of St Oran's parish minister Edinburgh, George Ross 24 Broughton Street Edinburgh, Jessie (?) Ross 24 Broughton Street Edinburgh. (Deceased) Death*: Jane Cattanach Stirling died on 24 February 1984. (Witness) Memorial Inscription: She is commemorated on the headstone erected in April 1975 at Dunnichen Parish Church, Letham, Angus, Scotland. Inscription reads S In loving memory of Mary Stirling died 6th April 1975 aged 85 years and Jane Cattanach Stirling widow of the Rev Joseph McPherson DD died 24th Feb 1984 aged 93 years. (Witness) Memorial Inscription: She is commemorated on the headstone erected in June 1905 at Dunnichen Parish Church, Letham, Angus, Scotland. 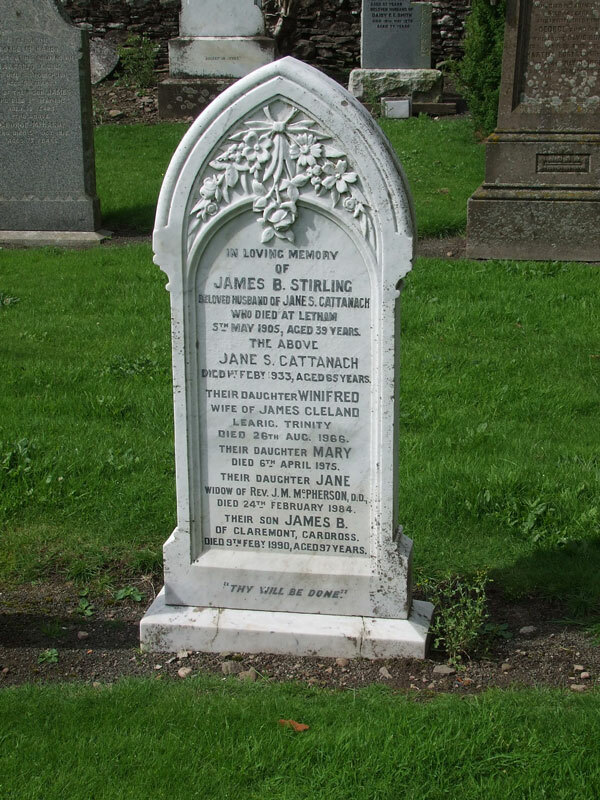 Inscription reads In loving memory of James B Stirling beloved husband of Jane S Cattanach who died at Letham 5th May 1905 aged 35 years. The above Jane S Cattanach died 1st February 1933 aged 65 years.Their daughter Winifred wife of James Cleland, Learig, Trinity, died 26th Aug 1966, their daughter Mary died 6th April 1975. Their daughter Jane widow of Rev J M McPherson DD died 24th February 1984, Their son James B of Claremont, Cardross died 9th February 1990, aged 97 years. "Thy will be done."